The Senior camogie team from Castlecomer Community School qualified for the Leinster camogie final after a hard-fought win over Abbey Community College, Ferrybank on a score line of CCS 6:10 vs Abbey CC 0:12. The game was played on Monday January 14th in an impeccably well turned out pitch on Castlecomer school grounds. Goals were key and Meadbh Walsh and Grace Mulhall got five goals between them. The girls had a short turn around as the match was played on a Monday and the final was Saturday. 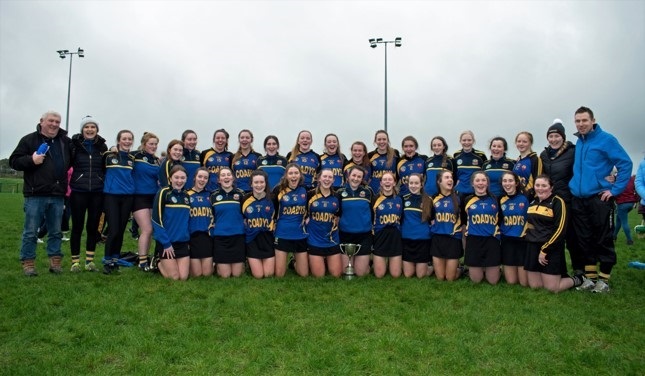 The Senior camogie team from Castlecomer Community School played Borris Vocational School in the Leinster B Final in Fenagh, Carlow GAA Centre of Excellence on Saturday noon the 19th of January 2019. This game was a game of two halves with Borris dominating the first and Comer taking control in the second half. Castlecomer started off slow as Borris had 5 points on the scoreboard without reply. After 18 minutes ‘Comer put their first score on the board with Grace Mulhall finding the back of the net. This was after clever play from Meadbh Walsh. This lifted the ‘Comer team but Borris responded with 3 quick points, followed by another 2 leaving the score 1-0 to 0-9 at half time. The result looked beyond Castlecomer with Borris dominating all over the field. Comer were the first to respond in the second half by putting a point on the scoreboard. Goalkeeper Ellen Gunner who was excellent throughout the game, made a wonderful save to deny Borris a certain goal midway through the second half. Borris continued to attack but failed to raise a flag. There only score of the second half was a point from a free. Comer responded with a great point from Meadbh Walsh. Comers two midfielders started to dominate the middle of the field and set up numerous scoring chances with long clearances. Comers midfielders were busy pumping in balls into the full forward line resulting in two hard fought goals from Amy Brennan and Grace Mulhall. Borris then scored a point from a free, but the girls responded with another goal and a point from Grace Mulhall. The final whistle was blown and the girls were Senior ‘B’ Leinster Champions 2019, on a score line of 4-3 to 0-10. They now go on to represent Leinster in the All Ireland Semi Final on the 9th of February. Venue and opponents are not yet confirmed.